Dave says about a ’71 Valiant? In any event, I love the juxtaposition of the yellow and rust (and rusty yellow) against the modern background. The lines on those old cars were classic! A Valiant, huh? Funny how guys (I think it’s mostly guys) know these things. 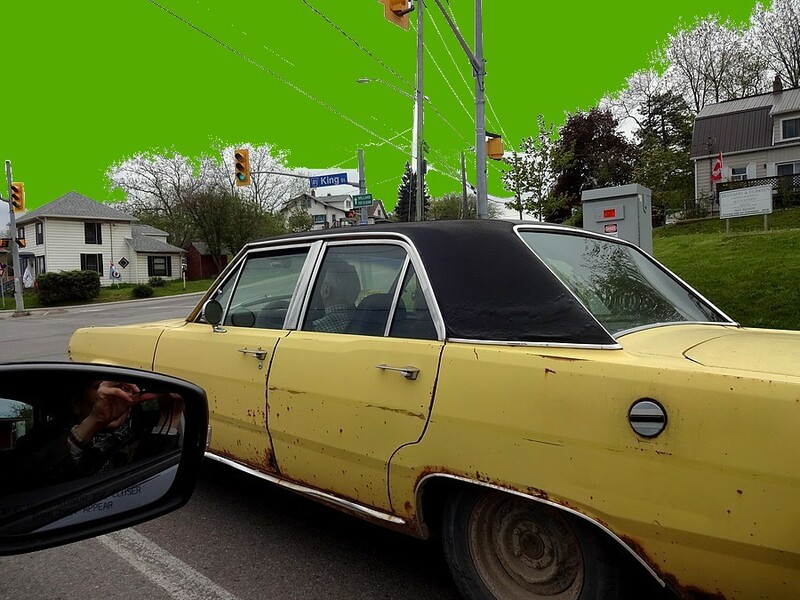 Me, I see a rusted yellow car from yesteryear and think “Oh look, a rusted yellow car from yesteryear.” Doesn’t even cross my mind to wonder *what* kind of rusted car. But I appreciate that kind of knowledge. This was spotted at an intersection a few weeks ago. I changed the colour of the sky (in case you wondered if I was in OZ) but nothing else. This guy is story-worthy to me. I loved sitting there at that red light and wondering why on god’s green earth he was so attached to this thing, this… Valiant. Well, there’s the title right there. Love the composition here – also the mystery of what is going on in the photographer’s side mirror; I enlarged to no avail. It’s all very well making up stories about other cars, ms. M … but…. Ah well, you get the drift. Great capture and wonderful green sky to bring the whole scene together. You always get me, B.
I’m with you. I wonder why he has that car, where he’s going (maybe just around the block for a “spin”) and what he’s thinking and feeling as he drives along under that grass green sky. Oh, and what’s playing on the radio? Now that’s an appealing selfie, Carin … the old bomb is pretty cool too and I LOVE the green sky.